The magnificent pavement of the Duomo in Siena will once again be completely uncovered from this Monday, August 18 through October 27th, 2014. Described by Vasari as the “most beautiful… grand and magnificent“, major sections of the marble pavement are usually covered to protect them from the feet of the numerous visitors and faithful that visit the cathedral every day. The pavement mosaics are truly amazing and unique, not just for the techniques used but also for message in many of them, which constantly evoke the search for Knowledge. The possibility to admire the pavement in all its glory is worth alone the trip to Siena, especially if your time is limited but can visit one thing in Siena – this is it! Created between 1369 and 1547, the floor is made ​​up of 56 scenes carved or inset in marble by some of the greatest Sienese artists of the period such as Sassetta, Domenico di Bartolo, Matteo di Giovanni and Domenico Beccafumi (the only exception is work by the great Pinturicchio, who was considered a “foreigner” as he was from Umbria). A magnificent work as much as it is complex: the floor was in fact only fully completed in the 1800s, after more than 600 years. 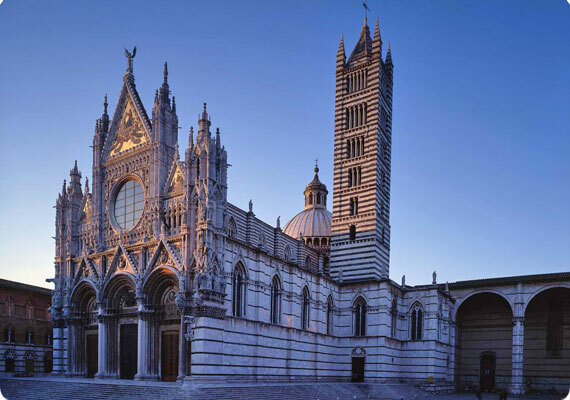 To learn a bit more about the pavement and the Cathedral of Siena, read this article on the Siena section of our site. The OPA Si Pass permits you to visit the cathedral as well as the Museum dell’Opera where you’ll be able to see Duccio Buoninsegna’s magnificent Maesta’ as well as the map of the Duomo’s pavement done by Giovanni Paciarelli in 1884 which permits you to have a full view of all of the sections of the pavement. You can also climb to the very top to the “facciatone” to enjoy an extraordinary view on the city of Siena, as well as visit the Baptistery and Crypt as part of the ticket. If you would like to view the pavement from on high (as in the picture above), you can get the OPA SI Pass Plus which includes access to the “Porta del Cielo” or “Gate of Heaven” itinerary. For centuries, the areas under the roof were closed off but the cathedral renovated the areas and created a special route to allow visitors to get a completely unique view of the Duomo from up high. This part is done in the company of a specialized guide who will be able to shed light on many aspects of the cathedral, its history and the pavement so it is highly recommended! Visits are offered in various languages but do require booking ahead of time. You can book by phone at +39 0577 286300 (Monday-Friday 9am-5pm local time) or email at: opasiena@operalaboratori.com. The OPA SI Pass is 12 euro from March 1- October 31 and 8 euro from November 1 – February 28. The OPA SI Pass Plus which includes the Gate of Heaven is 30 euro. For kids up to 11 years old, ticket is 7 euro. Visit the official website http://www.operaduomo.siena.it/ for additional details.